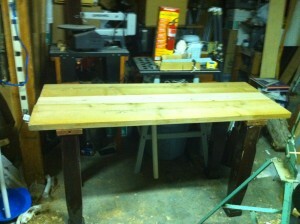 OK, after much deliberating and wrangling of hands, I’ve decided to start in on building my new work bench. It’s been a pretty rough time trying to get this point, full of second guessing, changing plans, and lots (too much) research. I’m still quite new to the whole hand tool woodworking world, so I’m not as sure as I’d like to be that I’m going to build something that will work for what I want to do. Because I don’t entirely know what I want to do yet. I’ve opted to build something similar to the “Nicholson” workbench, an old English style bench that uses a torsion box style rather than a super thick benchtop. I’d love one with a 3″ thick solid maple top, but that is beyond my meager means, and time is a factor. I have some material already, so why not build the easier build first, learn the lessons of what I REALLY need on this bench, and build another one later. Plus, as I’ve learned so far, you need a bench to build a bench. A recent project I completed has come in very handy so far. 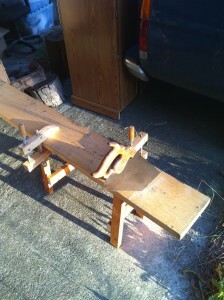 The sawbench! Along with a couple wooden clamp, and the Disston crosscut saw I’m working my way through these boards quickly, and accurately. It makes a world of difference in my sawing, a task I used to fear more than anything. Now if I could just do something about the sore shoulder muscles. For the legs I’m using these bed posts I got from a salvaged bed frame my friends Jason and Julie gave me after it got damaged during moving. It was all nice teak veneer, over mystery wood (likely “Ramin” hardwood). The posts are solid enough though for my purposes, and add a nice decorative element. 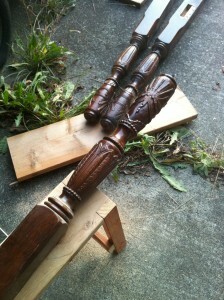 Too bad I couldn’t work the carved finials into it some how. After a hard days sawing, I had this to show for it. It’s just all balanced on top of the legs, to test the height. You can see the table-saw and router table I used to use all the time pushed to the back. I’ve been going more and more towards the hand tools of late. Much less noisy, and dusty. The only exceptions are my cordless drill, and the lathe. All in all a good start.